Happy Holidays! I am wishing for an amazing month of celebrations for you and yours! Even though we are heading into Christmas, it’s time in the stamping world to think about Valentine’s Day. Mad About You will not disappoint you and will easily meet your Valentine needs. 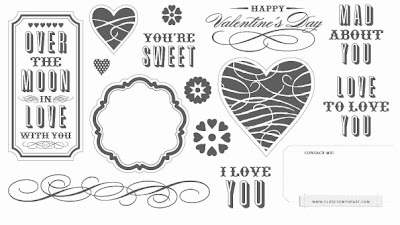 The stamp of the month can be purchased outright at $17.95 or with a $50 order; it is yours for just $5.00! Here is an example for you using this set. Watch for many more examples during the month of December! I am really excited to tell you about Rock the Block! 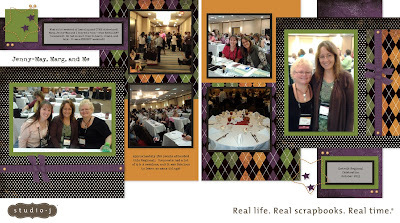 If you have purchased any of the My Creations items (page 131 of your idea Book), you know what good quality they are and how easy they are to alter to meet your needs. 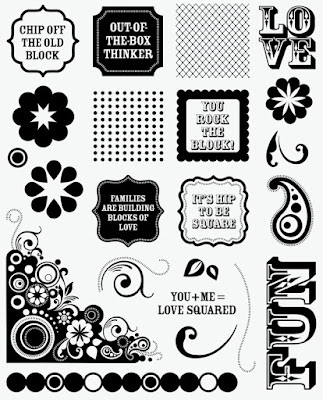 With this special, you will get a set of 9 collage blocks in a tray along with an 8-1/2”x11” stamp set. This set has a value of $49.90, and with your purchase of $25, you can get it for just $15.00!! I LOVE this set! It allows for so much creativity and really, you can do whatever you’d like with the blocks! Watch my blog in the next week to see what I am doing with mine. Bring your Rock the Block set to my house, and I will help you put it together. Often all we need is to do is chat a little, eat a little, and see the creativity of others to finish our own work. I’ll give you some tips and ideas that make working with the My Creations items easy and fun! 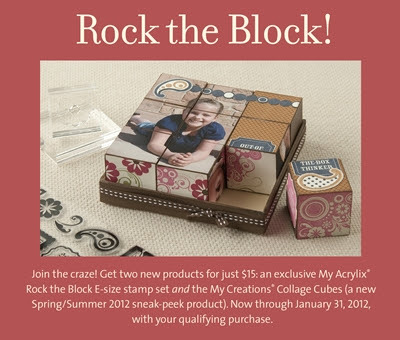 This is a free class when you purchase the Rock the Block set! RSVP by Thursday, January 12th. If you would like to purchase a kit to create the four pages at home, the cost with shipping is $25.00. 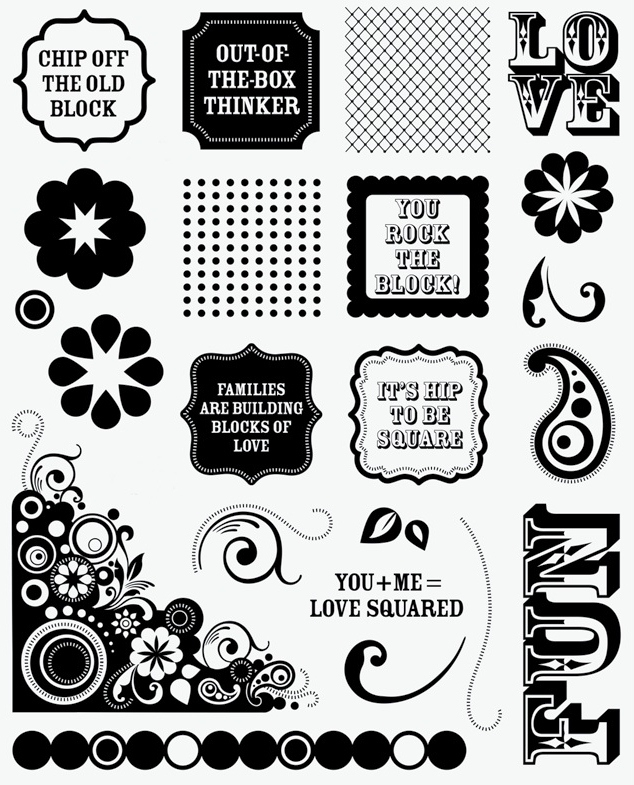 All of the pieces are pre-cut and all stamping is done for you. What a great way to have four pages done for your Christmas pictures! We will be exploring the 700 images on the Art Philosophy cartridge and creating several items. If you have purchased the Art Philosophy cartridge this class is free of charge. If you would like to come to see what this cartridge can do before purchasing the collection, there is a nominal fee of $5.00. Should you decide to purchase the collection, I will subtract $5.00 from your total! RSVP by Tuesday, December 6th. Do you need a day to get out and get some serious (or not so serious!) scrapping done? The cost includes lunch (sub sandwiches), dinner (chili & cornbread), demonstrations, and hourly prizes. They are always a lot of fun! I have 8 openings left for this crop, so please let me know if you are interested. The crop I had in November filled up with a waiting list, and I am certain this one will, too! ARE YOU LOOKING FOR A FUN EVENING WITH FRIENDS? I would love to come to your home and show you and your friends what is new with Close To My Heart. I can help you plan a Gathering with a free make and take where your friends and family will have a blast! There are always prizes and great booking rewards. 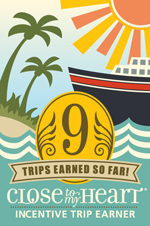 Along the way, you'll earn generous Hostess Rewards, possible half-price items, and a generous Hostess Gift from me! I have just a couple of openings left for January and February. Whether you have a Home Gathering or Online Gathering, your Hostess Rewards are the same! Contact me today (763) 227-0583 or by e-mail to set up a date - it's the perfect time of the year for a Home Gathering! Thank you again for sitting down to read my newsletter. I so appreciate your loyalty and your business! You are a busy lady! Once again, wish I lived close enough to take your classes! Looking forward to getting my new CTMH goodies!